It’s time for us to call on you – our network of open government enthusiasts – to help steer the development and delivery of Scotland’s second Open Government Action Plan. Nominations have now opened for eight spaces on Scotland’s refreshed Open Government Partnership (OGP) Multistakeholder Forum, known as the OGP Steering Group in Scotland. The Steering Group will have oversight of the development and delivery of Scotland’s 2018/20 Open Government Action Plan. These eight spaces will be filled by members of Scotland’s Open Government Network, with the other eight spaces filled by Scottish Government representatives. All you need to do is nominate yourself or another member of the network via the nomination form by Sunday 15th April 2018. If you are a member of Scotland’s Open Government Network – if you’re signed up to our forum then that’s you – then you’re eligible to stand. Whether you consider yourself an expert or simply care about how government can work better in Scotland, put yourself forward to be part of this unique experience. Nominating yourself is incredibly simple and all you need to do is answer some simple questions about why you would like to represent the network on the Steering Group. You can also nominate someone else in the network if you think they’d do a great job – if you do, we’ll get in touch with them to ask if they’d be interested in standing. 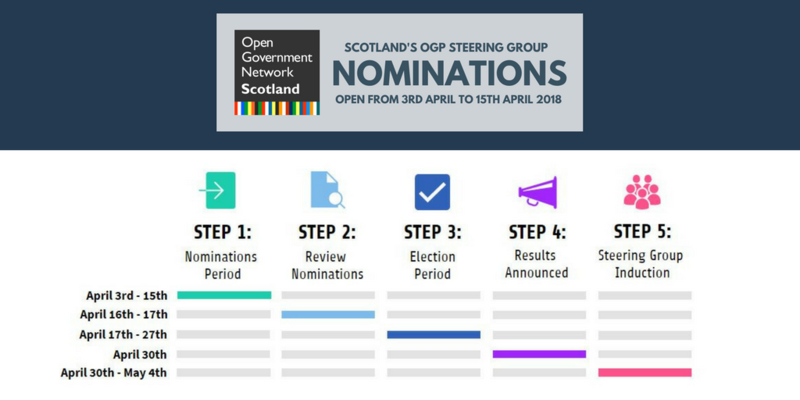 You can find out more about the Network’s selection process for Scotland’s OGP Steering Group and more details about the role here. You can also find the OGP Steering Group Terms of Reference here. I’m also happy to take any calls or respond to any emails if you have questions about the role of OGP Steering Group members. You can also email to request the online form in alternative formats. Looking forward to receiving lots of nominations – over to you!